Aging can slow down your mind and make everything a bit fuzzier. That's why it's important to keep your brain active and engaged. Mental exercises are a great way to do that. Keeping up a good state of mental health and having clarity of mind when you form thoughts is essential for staying independent as you grow older, and feeling healthy in general. One good way to do that is to use exercises to maintain mental clarity. These four will help you keep your brain sharp even as you get older. You’ve probably seen one of those pictures with a series of words written in different colors. For example, the word “blue” may really be written in green, the word “black” in yellow, etc. This image is based on a psychological principle called the Stroop effect. Our first exercise for maintaining mental clarity involves finding one of these charts (searching “Stroop effect” should be enough). Then, start reading the color each word is written in out loud. Do this until you have read every word and then go backwards, starting with the last one. This will be a workout for both brain hemispheres, because they have respond to the perception of text and color. Create new connections between the two hemispheres of your brain. Train yourself in a new set of abilities like concentration and attention switching. To do this exercise, the Schulte table, you start by concentrating on the number in the center. Along with focusing on the number 19 (in this table), you have another goal: find the number 1 and continue with all the other numbers in ascending order. But, you have to always keep your focus on the number in the center. This exercise can help maintain your mental clarity because it helps increase your information processing speed and develops your peripheral vision. You can also do a simple exercise with your fingers. Make a peace sign with your right hand. At the same time, make an OK sign with the fingers of your left hand. Then do it the other way round and repeat several times. Once you’ve done it with both hands, you’ll need to try to do them both simultaneously, alternating signs between each hand in its own cycle. Increase and train your capacity for concentration. Improve both your attention and your ability to switch quickly between one task and another. This isn’t as easy as it might sound, because it can be very hard to synchronize your body in this way. This is the last of the exercises to maintain mental clarity that we’re going to talk about today. Doing simultaneous writing can help a lot if you want to exercise your memory. To do this, you need 2 pieces of paper and a pen for each hand. First, start by drawing different geometric figures with both hands at the same time. You can also write letters or words of the same length. The key is to do it simultaneously. Otherwise, the exercise won’t work. The benefit of this exercise is that it teaches the brain to do several tasks at the same time, activating both hemispheres. It’s a good idea to train your non-dominant hand. In other words, if you always brush your teeth with your right hand, try doing it with your left hand and vice versa. This way, your brain learns to give orders and do actions different than what it’s used to. You can also shower and do other daily activities with your eyes closed. Change your routine when you’re going to work, to the shore or other places where you often go to activate your memory. Doing exercises to maintain mental clarity is really important, but so is eating well. After all, diet plays an important role in reinforcing your memory. 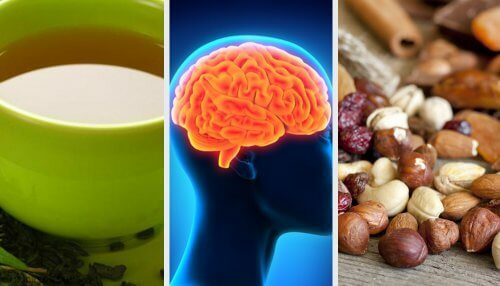 There are specific nutrients that help your brain keep working well. It’s also important to give your brain sufficient glucose. After all, glucose is the motor of our brain. Try to choose sources that are absorbed slowly. By combining these exercises to maintain mental clarity with a good diet, you’ll be taking a big step towards keeping your brain young and healthy.